Not the most concise title but I wanted to cover a bit of ground with it. I am leading a week long Multi Platform development residential lab next week in the Southern Highlands of New South Wales with some of the worlds leading mentors and Australia’s top projects – all linked to Screen Australia. This is followed by a one day seminar in Melbourne called ‘Idea to Market’ and top and tailing all of this, I have taken up the Executive Producer ABC Multi Platform TV role. More on each coming up. As you know last year I founded StoryLabs, a global transmedia IP development network, with 3 other individuals in Canada, US and UK. Then, new format funding body, Screen Australia who were looking for a very practical, production orientated rapid development structure for their Digital Ignition initiative, looked to StoryLabs. Screen Australia has engaged transmedia collective StoryLabs to direct the first workshop, under the guidance of its key founder Gary Hayes. He is recognised as one of the foremost digital thinkers. An award-winning multi-platform producer, author, educator and director. The founding director of global multi-platform training initiative StoryLabs he has recently become Exec Producer of ABC Multi Platform TV. He was the director of AFTRS’s LAMP program for 5 years, was Senior Interactive Development Producer at the BBC for 8 years, and was a Social TV Producer in the US. Gary has designed and lead multi-platform/transmedia courses internationally and in Australia with AFTRS and Metro Screen. He also runs MUVEDesign (creating story based augmented reality, virtual worlds and transmedia) and the influential media and marketing site PersonalizeMedia.. Gary will be supported by up to eight high-calibre international and domestic experts. Seem to be in list/research mode at the moment and was looking for one place on the web that had a list of stats about the mix of male and females across the ‘game/virtual world’ space. I have actually found it useful to highlight many of the type of stats to clients who still believe console games, online ‘quest’ based games and virtual worlds are still the domain of twenty something, slightly overweight, couch potato, anti-social males. Nothing could be further from the truth. Read on, and in no particular order! note: Cross-posted on MUVEDesign (my virtual world build site). Independent of all other factors, younger adults are still more likely to play games. Among older adults 65+ who play video games, nearly a third play games everyday, a significantly larger percentage than all younger players, of whom about 20% play everyday. Computers are the most popular among the total adult gaming population, with 73% of adult gamers using computers to play games, compared with 53% console users, 35% who using cell phones, and 25% using portable gaming devices. Online casual games bring in 150 million women every month— roughly half the population of the United States. Nearly two-thirds of women casual players online are over 35. Women play casual games 5 to 10 hours per day — significantly greater than the 7.4 hours per week by a survey by the Casual Gaming Association. Competition, rather than simple relaxation or escapism, motivates them to play. Playing casual games is often the first thing women do after waking. They check their ranking and play for on average of 2 Â½ hours every morning. Women engage in trivia games with the family members but play action games alone. Most women players are married or in a relationship and have children. Online Gaming Popularity Grows Among Youngest and Oldest Female Segments in the U.S. ComScore report. Significant user growth among teenage girls between the ages of 12 and 17 and women between the ages of 55 and 64. The over-55 age range grew 43%. It found that the most hard-core players are female, that gamers are healthier than average, and that game playing is an increasingly social activity. Despite gaming being seen as a male activity, female players now make up about 40% of the gaming population. The study (detailed link here from Wiley interscience) looked at gender differences in more than 2,400 gamers playing EverQuest II. The average game player is 35 years old and has been playing games for 13 years. The average age of the most frequent game purchaser is 40 years old. Forty percent of all game players are women. In fact, women over the age of 18 represent a significantly greater portion of the game-playing population (33 percent) than boys age 17 or younger (18 percent). Sixty-three percent of parents believe games are a positive part of their children’s lives. Spend as much as 20 hours each week playing their favorite games. More than 70 percent said they play at night, and 58 percent have no children living at home. Results from the Harris research reveal that 67 percent of the women over 40 who play games do so at least four times per week. Nearly half play every day. Some 60 percent say they would rather play a casual game than talk on the phone or do projects around the home, while nearly 50 percent said they would rather play a casual game than go to a movie. The “couch potato” image of computer gamers is unfounded, with many in better than average shape, claim US researchers. More than 7,000 players of the online game EverQuest II were quizzed about their health by scientists. They found gamers’ body mass index (BMI) tended to be lower than the US average – with many taking “proper” exercise more than once a week. 24 percent are over 50. The percentage of female video gamers climbed from 33 to 38 percent in five years bolstered in part by Nintendo’s Wii, but also “interactive group games” such as Singstar, Rock Band, and Lips, as well as The Sims, The Movies, Nintendogs and NeoPets. Scramble which is the only game among the top three developers dominated by women(63%). The age of Zynga players is spread more evenly among the three age segments, but with ~50% in the 22-25 age bracket. Blake Commagere’s Monsters games also have ~50% of their users in the 22-25 age bracket. They also have a fairly even male-female ratio. 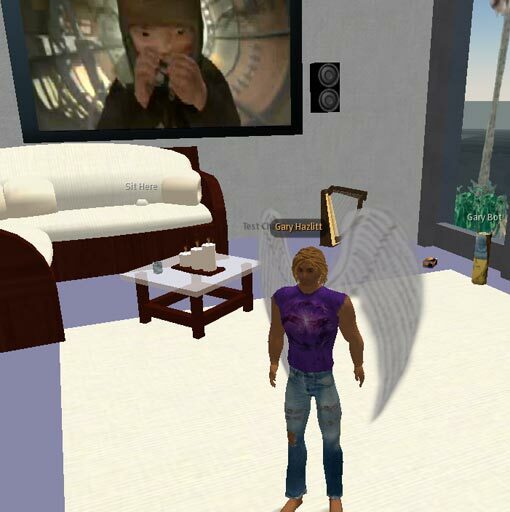 Females spent nearly twice as long online in Second Life as males. Females make up 45.5% of the Second Life population. Those 45 and older continuing to be the heaviest users on average. On average, they spend 22.7 hours per week playing WoW. There are no gender differences in hours played per week. 13 is the average number of years adult gamers have been playing computer or video games. Among most frequent gamers, adult males average 15 years for game playing, females for 12 years. 59% of gamers play games with other gamers in person. This is a rise from 56% in 2007 and from 51% in 2006. 56% of online game players are male 44% are female. What is the One Type of Online Game Played Most Often? Electronic Arts’ casual game site Pogo.com draws 11 million unique users per month. Fifty-five percent of those are women. On the subscription side, 75 percent of the more than 1 million subscribers are women over the age of 35. Women were found to be slightly less likely than men in the 25-34 bracket to play traditional console games on systems like PlayStation or Xbox. Video: Cinematic Game Renaissance – Game Now Leading Film? Have we reached a tipping point – with many more user hours spent with games than films are they now more culturally relevant (as in our cultures are saturated with them)? With most films having ‘game-like’ story arcs and, at the last count, nearly 80 films with stories based on game titles in production I am starting to think so. Game culture and their inherent stories are now absolutely mass media. In a low risk, and dwindling film business, creating stories around experiences that people have already spent 20-40 hours immersed in the story world, is a no brainer, so what we are seeing is a threshold now of game-like films but more importantly films based on games. Anyway more after the ten minute video – stick with it. I am designing curriculum for cinematic games and virtual worlds at AFTRS but also doing another report on the market potential of this cross-media, gilm (game/film) landscape. In the process again I threw together a compilation video of notable examples (I know there are at least ten times this btw!) interspersed with tasty quotations. “The Cinematic Game” was initially designed to be a look at the cross-promotion and story development potential of this most powerful mixed-media marketing machine. But, during the process though I was staggered to see the number of major feature films in production based on new and existing game universes (listed in this post below and scrolling at the end of the video) – suggesting to me a tipping point. Game story starts to lead film development? The idea is to repeat the success of companies such as Marvel Entertainment (MVL) and Hasbro (HAS), which used their base of fans to transform from marginal companies into Hollywood players. After licensing Spider-Man to Sony Pictures for a string of hit movies, Marvel has created its own studio, with Iron Man and other films set for release this summer. The Hasbro-backed Transformers movie grossed more than $400 million in 2007 global box-office sales, which in turn boosted company sales of movie-related toys and games. We’re going to favour those publishers that recognise and appreciate how much we can add value to their artists… in the case of those kinds of products, you should be paying any money at all and whether it should be the reverse. Back to the main thread of the post, it does make you wonder how many screenplay writers are sitting in front of their XBoxPS3Wii’s looking for inspiration nowadays? Variety suggests that in fact ‘all’ games could be made into movies but I will be really interested in what kind of film comes from The Sims and already know the likely story arc of MassEffect having run through it a couple of times but many others on the list below will be of interest, especially World of Warcraft which has around 4000 story threads/quests – so which story will we be ‘offered’?Films of games have had a shaky past with only a few critical successes such as Tomb Raider, Silent Hill, Resident Evil (there are several on slide 75 of my game/story presentation below, that I did several months ago) but given the serious money and credible directors such as Landau, Lucas, Speilberg, Cameron, Jackson etc: plus a deep desire to properly reflect the integrity of the ‘interactive’ experience, the tide is turning. Being an avid machinima maker I know at first hand what it means to capture the ‘essence’ of game playing, adapt it, reflect it and, if you understand the culture of the game, interpret it – the good thing is A list filmmakers (as you can hear Peter Jackson say at the end of my video) understand it too. My film contains some of the better hybrids, either films inspired by games, games inspired by films or just very rich cinematic, story or character rich games. I make no excuses that I have used a mixture of cut scenes as well as ‘real’ game play in the video – that is really to show where we are heading as game graphics continues to hurtle towards the real time equivalent of the likes of Beowulf and other ‘trickle’ rendered CG features. After the quotes and textual references from the compilation below, are more elements on this very exiting hybrid cross-story, cross-IP, cross-reality world. When I found out one of my guildmates had died, someone with whom I had fought monsters, explored exotic lands, shared moments of jubilation and defeat, I wept. In spite of having never met him, the knowledge that we would not continue the story together, brought me great grief. We’re trying to understand the language of the film, but diverge in ways that are right for the game medium. Games sometimes can reveal things. To watch someone in movement, unconscious movement, can be very stimulating and revealing, whether they win or not. As a lead into a post about to be published I have been talking for a couple of years now (The Mixed Reality Perfect Storm ) about the fantastic potential of the live and by implication shared TV experience to be enhanced by extending the world into online games. It is exciting to think where we will be in a few years once the ‘broadcasters & studios’ realise that keeping an audience involved in the ‘IP’/programme in-between airings or sequels is a good thing. Good for the story creators, the latent creative audience and of course advertisers who need eyeballs/hands/ears/minds and hearts. A further afterthought there are several companies around the world developing Cross-Reality forms, one that I am heavily involved with‚ The Format Factory, are pioneering formats that bridge the space between compelling participatory TV/Film and online game worlds. They have a promotional video that metaphorically demonstrates some of the ’embedded’ world-within-worlds. A trailer video teaser for the mixed reality, inhabited TV formats being pioneered and piloted by The Format Factory. Ok the title sounds a little ‘space cadet’ and paradoxical but bear with me on this one because the implications go way beyond the focus of this post which is a quick orientation and guide to non-scripted but organised ‘social play’ inside a virtual world and a great way to plan a Real World Alternate Reality Game – or run a special form one inside the vr world. As you may have read on my previous post “The Personalization of Second Life” there are a few shared, virtual spaces that are infinitely personalizable and customisable. Second Life is the leader in this area and so has become the focus of many activities that require represention – a sort of ‘real as it gets’ for doing real world-type things in – a place to create something representing the real world, our physical world. (As a tangent I personally believe we need to move towards creating new and non-representations of our real world as most folk in SL tend to midly enhance their RL existences, build precise replicas of the first life or a few enlightened ones are planning singularity! – I will not go into that rabbit hole as I posted about the Human 2.0 upgrade a few months ago). Back to the post which in theory sounds complex. Inside Second Life people get paid for organising events and ARG puppet-masters will and should be part of that mix. We need to go beyond just concerts or dances or bingo – but whole in-world game-play, that has some sophistication and plays on the paradigms inherent in the space. Another rabbit hole of game within a game – but SL is not realy a game but a created society, which makes it ideal for what I describe below in the guide element of this post. So we have a real world in which to potentially do things with far more imagination but more importantly, at lower cost and more efficiently. It takes minutes to build a complex 3D structure and texture map it, hours to construct a building with multiple floors and seconds to travel anywhere. It is in this context and the imaginative aspects of this world that it dawned on me an environment perfect for alternate reality gaming. 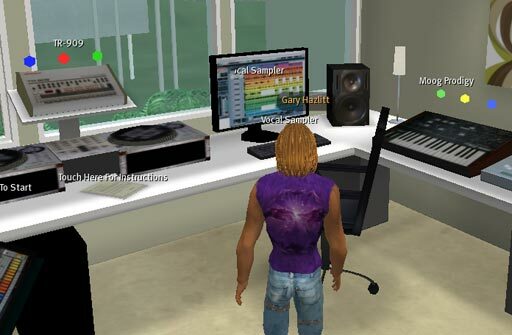 Second Life has all the raw ingredients for great Alternate Reality Game production and execution. FIRSTLY, though the basis on which all of this depends is that “the virtual space is regarded as being complete and of itself a self contained reality AND all participants have a shared perception of the space” – (note: participants who are agreeing to share a common narrative and not ALL residents yet). In other words, in this case, Second Life IS the world for the participants and everything that happens within it has no references (or shouldnt have) to the real world – the one your sat in now. This may be the paradox to some who would say that ARG’s by definition may contain a virtual game, not so here, this IS the world. So a fourth wall has to be created, the role playing by the characters in a piece has to be kept within the world, no references to the first world and so on. The challenge is getting everyone on the same song sheet – old SLifers have a completely different take on the world than newbies of course – and everything in between. More later. The story structure of the ARG must be closely aligned to the world of Second Life – because the narrative is suggesting something parallel or ‘alternate’ to the world, it should not also become too fantasy (more later). Because then we step into World of Warcraft, or Everquest territory – and that would be easy to do. No the story world here needs to play off the everyday world of Second Life (OK those who have not spent time here may think I have lost it or am reading way too much into, what many call a computer game…). No Second Life is a very immersive and time consuming experience – it is both worringly addictive yet extends in the most compelling way ones “dreams & desires” – but I digress yet again. Themes that would be easy inside SL include conspiracies around property given the relative high cost of land. Others around the many locations and buildings in terms of history, and previous events that may have happened there. Much could be built into corporate take over, the large shopping malls and potential mafiosa regimes. 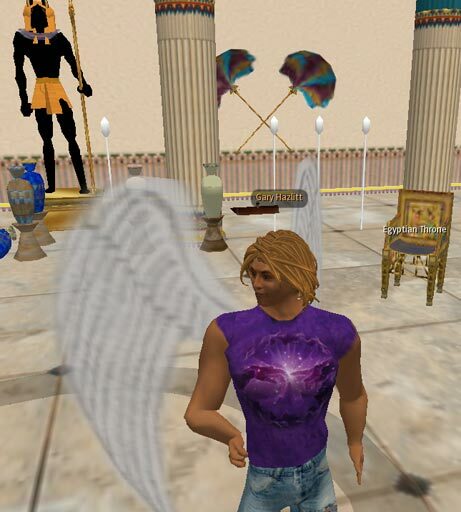 There are many ‘real life’ characters inside SL(due to the fact that they are ‘in’ the world most days) that could be used as something to generate myth – these ‘regulars’ do in fact constantly role play as well so they could be used. Also as many activities such as building, lectures, dances, concerts etc take place – anything can be built to that. Another kind of theme which a few of us have been improvising around in public spaces already 😉 would be the bizarre concepts around a ‘revolution against the overlords that run Second Life’. Bear with me on this one – a kind of phythonesque, satirical, nonsense stab at the ‘system’ on which SL runs. Can the inmates take over the asylum, biting the hands that feed it, Neo escapes the matrix and so on. There are many themes to explore as the backbone of an ARG inside Second Life that do not need to resort to fantasy. 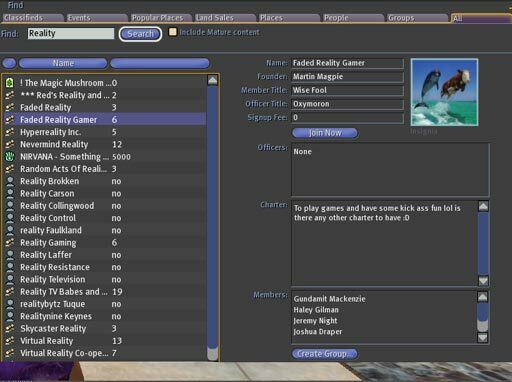 Second life has so many potential tools that designers of ARG’s inside it can draw on. It affords many things that are very difficult or nigh on impossible in the physical world, yet in SL are taken as granted. Here is a non-exhaustive list that from my experience so far could be used as virtual reality, alternate reality game tools. Easy and always on communication: IM and chat is ubiquitous inside SL. So talking to characters in front of you and in parallel IM’ing distant ones is VERY easy. Also you can deliver out of band, in other words leave messages for others with guarenteed delivery – now think sms or even email in the real ‘global world and the multiple carrier, spam nightmare. This is where global players can instantaneously communitcate in-game. 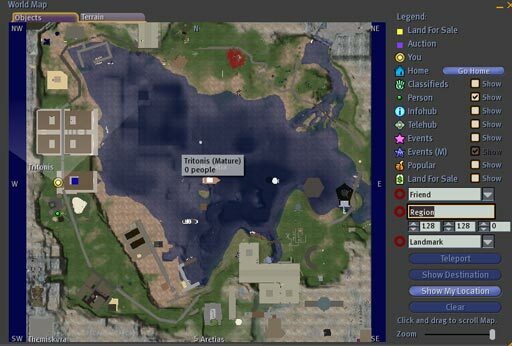 Location, location, location: To get to anyplace in Second Life one simply teleports. This means the whole 200 000 people world can be readily explored and therefore distributed widely and not tied to a specific location. That is not to say one location could act as base with dense areas of gameplay. Inter character exchanges: This is where any character can pass you objects, directions, teleportation coordinates, animations, notecards – the list goes on. A tool such as this really means clue discovery and passing stories between players is a breeze. Grouping: To create teams inside SL is also very easy, and new members can be added on the fly. Members of your group can be tracked across the built in maps. Orientation: SL has many ways to find things, people and know where you are. The built in search engine can point you at any person, event, place, object inside the world. So placing clues and red herrings etc: is also very easy. The mapping is incredible and zooming, scrolling across the many thousands of buildings combined with instantaneous teleporting on a double click means you can get anywhere from anywhere. Scripting: It is incredibly easy to put script into objects in SL. I used some pre-compiled code last night and modified it to build a greeting object (one that talks back based on pre-set text input) AND an answer machine AND something that sends you notecards AND even got into scripting motion – so things can move to locations on input or follow characters. So bespoke elements can be quickly added into the mix. Animation: Not an obvious element of the SL tool set to use, but well animated characters who are real life (inside Second Life) add to the sense of reality I think. Even though the character may look like Brad Pitt (just realised one of mine does a bit!) or some kind of cat woman, if the movements are fluid, then the world is all the more usuable and once immersed doesnt lead to sense of disbelief. True immersion should afford that. So get good skins (the texture around your avatar) and override (basic) animations using an AO (animation overridere) for your characters. Breaking the fourth wall: I would not do this myself but you can link to web pages – which boot an external browser – but dont go there. Finally one of the drawbacks of Second Life is that bespoke elements, objects and clues can only be placed on parcels (land) that the owner has allowed or placed there themselves. So in a distributed virtual alternate reality game (now that is a mouthful!) you will need a few recruits to both role play and allow physical clues or evidence to be pre-set. This should be an easy task as networks of like minded machinima, social design and others pushing the gaming element are easy to find inside SL, to communicate with and offer to help them in their pursuits – to reciprocate. Or as many do you can pay a small fee. Without going too mcuh into the design process of a social game within a game-like environment primarily because I have things to do in real life now! The design of the game here should follow simple rules – test, do some test runs on virtual strangers to make sure they get some of the directional elements. Make sure that the real players have enough knowledge of the mechanics of the world (how to use it) so they are not locked out because they cannot work out how to teleport (as a simple example). Cover your backs – if a clue becomes to difficult to decipher make sure you have an alternate way for them to get to it, a character prod and so on. Then the design of the ARGamePlay – whether everyone has to get all clues OR some are given only to certain teams who have to work together OR more usefully a mix of both of those make sure the timing is carefully worked out. If some things are easier than others then you will have teams losing interest once they have done their bit, if things are too hard, they may give up. But these sorts of techniques are discussed elsewhere by far more capable people – this post is about moving the ARG into the virtual space both for easy of production and to use some create tool sets built in already. I/we will be creating a bunch of VARG’s (virtual alternate reality games) at AFTRS and LAMP and will keep you posted on how it goes which should dovetail with the machinima we are starting to play with. One of the real problems I can see (which many of you would have already spotted) is that the ‘way of life’, the grammar of existance inside Second Life takes a few days or weeks to grasp – and then the control mechanics too. To newcomers it is a confusing world and orientation is quite steep. So for an ARG to work well all participants must be fully ‘immersed’ and understand the shared space and so called SL normality – whatever that is. There are enough shared ground rules though for it to work in my opinion if the participant is given a week or so to be acclimatized. Append: Looks like all great ideas come at once all over the world! Someone else with ‘ARG inside Second Life’ motivation no less than a day after this post 😉 – and who nicely refers back here. Cool – strength in numbers!